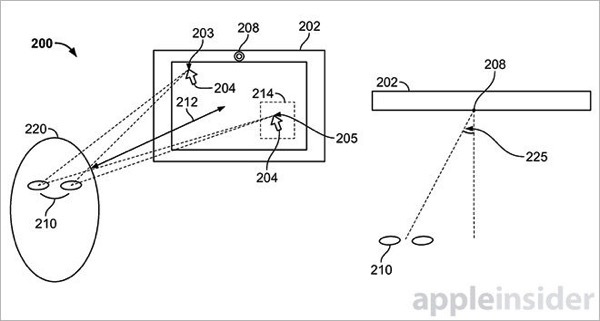 Apple today won a patent detailing an eye-tracking technology used to control a user interface on a mobile device or computer (via AppleInsider). The patent was originally filed in April 2012, and credits David P. Julian as its inventor. It imagines future Macs and iDevices containing a new camera technology called eye tracking. Apple suggests that translating the eye’s movement into a movement of the cursor on the screen would enable great benefits in using game consoles, entertainment systems, and even vehicles. In one embodiment, the invention employs eye-tracking hardware to follow a user’s gaze and relay that information to an onscreen GUI. A movable indicator is associated with a user’s point of gaze, thereby facilitating input through detection of eye movement. To thwart perceived cursor fade, Apple suggests a system that measures possible perceptual fading by detecting time elapsed between eye movements, blinking or a combination of both. By measuring the time between eye movements, as per any number of predefined thresholds, the system is able to counteract fade before it starts. The patent is interesting in the light of Apple’s acquisition of 3D scanning firm PrimeSense. Following that deal, rumours surfaced that the next-generation Apple TV could feature motion controls based on the technology supplied by PrimeSense.